Kabul: A powerful bomb killed an outspoken Afghan governor and 19 other worshipers in a crowded mosque Friday in northern Afghanistan, where insurgents are trying to expand their influence beyond the embattled south. 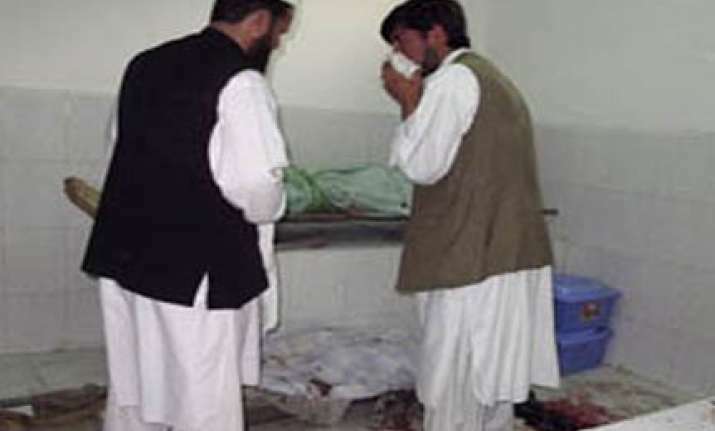 A wounded survivor said he believed a suicide bomber praying to the right of the governor carried out the attack, which wounded 35 people and took place in Taluqan, the capital of Takhar province. The death of Mohammad Omar, the governor of neighbouring Kunduz province, came just days after he publicly warned of escalating threats from Taliban and foreign fighters across the north. If steps aren't taken to counter them, Afghan and coalition forces will face "disaster," he said. "Violence in north and northeastern Afghanistan will increase like it has in Kandahar and Helmand," Omar said, referring to two provinces in the south where the Taliban have their greatest influence. "It will be very difficult for the government and the international community to conduct clearing operations and fight gunbattles in all parts of the country." Security has been deteriorating for the past two years in Kunduz and surrounding provinces -- known hideouts for the Taliban, Al-Qaida and fighters from other militant factions, including the Haqqani network, Hizb-i-Islami and the Islamic Movement of Uzbekistan. NATO has sent more troops to the north and has been pushing harder into militant-held areas the past several months, German Maj Gen Hans-Werner Fritz, the commander of NATO's northern regional command, said in a recent Pentagon briefing. The coalition is ramping up operations this month in "hot spots" to push out insurgents and establish better control of the area, he said. Although there were no claims of responsibility for Friday's attack, insurgents clearly were targeting the Kunduz governor, said Takhar Gov Abdul Jabar Taqwa. "He was the target, and the terrorists were able to kill him," Taqwa said. "This is a big loss for us because Mohammad Omar was a very brave and good governor. "Among those killed were university students who lived in a nearby dormitory, according to local officials. Abdul Haq, who is living in Takhar preparing for a university entrance exam, said he was about five meters (15 feet) away from the governor. Both were kneeling in the front row of the packed mosque waiting for the mullah to turn back to the worshipers and end the prayers. "Suddenly a very strong explosion happened," Haq said over the telephone from a hospital, where he was being treated for shrapnel wounds. "I think it was a suicide attack. I was on the left side of the governor and I think the suicide attacker was on the right side of the governor. "I wasn't completely unconscious, but I couldn't move," Haq said. "I saw the body of the mullah right in the same place where he was. He died there." In the aftermath, people grabbed sheets to remove corpses and body parts strewn across the mosque. A wall inscribed with the words "Holy Word of Islam" was pockmarked from the blast. Omar, who was born in Takhar province, was a member of the nation's ethnic Pashtun majority, as are most of the Taliban. He often spoke out against insurgents and pleaded with the Afghan government to send more security forces to the north. He survived at least three previous attempts on his life. Omar was a longtime commander in northern Afghanistan and served under Abdul Rasul Sayyaf, a key US-backed mujahedeen leader, during the Soviet invasion in the 1980s. Before he became governor of Kunduz in 2004, Omar served as governor of Baghlan province -- also in the north -- and mayor of Taluqan. Despite his position, everyone called him "Engineer Omar" because he studied engineering for a few years at Kabul Polytechnic Institute, said Gen. Abdul Razaq Yaqoubi, former provincial police chief in Kunduz.A year and a half ago, Omar's brother, Noor Khan, the police chief of Archi district in Kunduz, was also killed by militants, Yaqoubi said. "And they tried to kill Omar several times before," Yaqoubi said. "Unfortunately this time, the militants were able to kill him. I have lots of good memories of him. He was a good friend. He is not among us anymore. It is a big loss. "The focus of the war, which entered its 10th year this week, has been on the south, but coalition troops are fighting resilient militants in both the east and north. On Wednesday, an airstrike and a raid by NATO ground troops in Takhar killed eight insurgents, including a senior Taliban leader, Maulawi Jawadullah, who spearheaded attacks against Afghan security forces in the north. On Tuesday, the coalition announced that an insurgent involved in the kidnapping of a New York Times reporter was captured in Takhar. The unidentified militant was linked to senior Taliban and Islamic Movement of Uzbekistan leaders in northern Afghanistan and Pakistan, NATO said. Journalist Stephen Farrell and translator and reporter Sultan Munadi were taken hostage in September 2009 when they went to cover a NATO airstrike of two hijacked fuel tankers that killed scores of Afghan civilians. Munadi and a British commando died in a raid that rescued Farrell.